This music was made over a period of 17 years involving musicians from many countries. It\'s parents are a jazz musician and a folksinger. 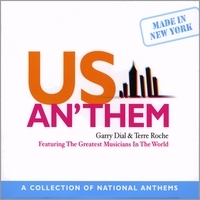 National anthems done like you\'ve never heard them before. Inflammatory political rhetoric has been front and center in the mass media for decades. selfless or bereft of impartiality. with Paul Simon, King Crimson’s Robert Fripp and others. Dial has as a result emphasized the passion factor in his academic discipline. Producer Bob Justich giving them the free rein to do so. Dave Brubeck take on Austria’s Land Der Berge, Land Am Strome. Samir Chatterjee (India) and Namgyal Neshi (Tibet). "Two measures into the Brazilian National Anthem I was considering renting a condo in Sao Paulo. This is one of those rare occasions when expectation proved a sad reminder of my limited perspective on what is possible. You and Garry have far exceeded the already lofty idea I anticipated. The album is like those Russian nesting dolls where you open one, and another is revealed,and another,and another. Each a perfectly calibrated gift. Each connected but separate from the one before. The connection here, of course, being the global bond of music. The fact that we're listening to national anthems is almost an aside. Any scent of pomp or ceremony is deftly deflected by the jazz flavored arrangements and realspeak vocal interpretations. Even the more traditional and familiar compositions are given a nuanced twist that made me hear them as if for the very first time. My pitch would be something like: "If world travel isn't in the cards for you this year because of money or airport anxiety, pour yourself a good wine or cold beer. Get comfortable and hit the 'play' button on "Us an'Them". You'll be transported to places you've never been and places you'll remember well." And again, I think the cover art "pops" and instantly conveys a sense of the unusual tracks secreted within. It's something of a passport, bearing stamps of officialdom and whimsy, bold fonts and cloud continents. Thanks!" - C.
The intent of this project, from it's conception, is enough to celebrate it's birth. Extraordinary intention has produced extrordinary results. It is "real" and you can feel it. And it is a triumph. I would love to hear someday that school kids were listening to and watching copies of this CD & DVD. Maybe beginning their own anthem projects and perhaps in the process coming to love not only music but the cultures and peoples of the world. Imagine the extraordinary results. If music is the universal language, Terre and Garry are some of our most creative interpreters. They have produced an international tribute that reflects a running theme of respect for cultural diversity. That sense of respect is heard and seen through a variety of anthems, performing artist(s), instrumentation, lyrics, and arrangements. The end result is a feast for the eyes and ears. After listening to the CD and then watching the DVD, I better understood the scope of the project and the long-term commitment to produce it. The musicians are world-class, the music is first-rate, and the DVD ties it all together. A very entertaining and educational listening and viewing experience. Worth the money and then some! National anthems, gospels of place and identity, are songs that shape how we see ourselves and the rest of the world. Listening to anthems that are not our own is an emotionally direct route toward understanding other societies and the myriad of immigrant subcultures existing in our own country. Although this collection of anthems from around the globe was seventeen years in the making, the timing of its release - just prior to the US presidential election - feels perfect. As we in the US shake off the weight of our past, apologize for our eight-year bender and prepare to rejoin the rest of the world, the moving music on this CD is exactly what we need to hear - a musical antidote to isolationism, a spectacular achievement of multi-cultural consciousness-raising. Buy this CD for yourself, your friends and especially for your children. This is heartfelt world music like you've never heard before. The accompanying DVD alone is worth the price. When you hear Terre Roche sing the "The Star Spangled Banner," beautifully accompanying herself on guitar, make sure you have a box of tissues nearby. You'll swear you've never really heard it before.